Under-fire Chelsea manager Jose Mourinho cut a frustrated figure as he weathered questions about his side's bruising 3-0 defeat at the hands of Premier League title rivals Manchester City. Ever the pugilist, Mourinho protested that Chelsea's improved second-half performance on Sunday meant the scoreline was "fake", but neither the impression left by the game nor the statistics bore him out. Eden Hazard forced City goalkeeper Joe Hart to save at 1-0, but it was Chelsea's only real chance at that stage and the hosts finished the game having recorded eight shots on target to the visitors' three. Bloodied after a week that saw him roundly criticised for demoting medics Eva Carneiro and Jon Fearn over a row about their treatment of Hazard during the 2-2 draw with Swansea City, Mourinho was reduced to claiming that City had abandoned their principles by tightening up in the second half. It was a tactic he had employed after Chelsea's 1-0 loss to Arsenal in the Community Shield, when he accused Arsene Wenger's team of "leaving their philosophy in the dressing room", and it felt like a similarly redundant observation at the newly expanded Etihad Stadium. City manager Manuel Pellegrini reacted prudently as his players fought to protect the lead procured by Sergio Aguero's 31st-minute goal, sending on Samir Nasri and Martin Demichelis. Mourinho said it was a sign that City felt "in danger", but there was a grain of truth in Pellegrini's assertion that "in our worst moment, Chelsea didn't have chances". Mourinho, whose side trail City by five points, said he was startled to see Aguero granted so much space in the first half when he and his defenders had spent "all week" planning how to stop him. He also explained that his surprising decision to remove John Terry at half-time - the first time he has withdrawn his captain in 177 league games - was purely due to a desire to add Kurt Zouma's pace to the back four and move Chelsea's defensive line further forward. Terry, 34, played every single second of Chelsea's title triumph last season and there was a note of irritation in Mourinho's voice when he was asked why it was he, and not Gary Cahill, who had been withdrawn. "I don't know if you ask many questions to (Rafael) Benitez, Andre Villas-Boas, Roberto di Matteo, to the ones that never played him," Mourinho replied, citing some of his predecessors in theChelsea dug-out. "I am the one you shouldn't ask because I am the one who played John every game, made him captain, recovered him from a difficult situation with other managers and had the right to say I want Zouma on the pitch." The display is only like to accelerate Chelsea's pursuit of Everton centre-back John Stones. Left-back Abdul Rahman Baba's arrival from Augsburg was confirmed by the German club on Sunday. While Mourinho stewed, Pellegrini was left to reflect on a performance that immediately reinstalled his side, deposed by Chelsea last season, as the Premier League's team to beat. 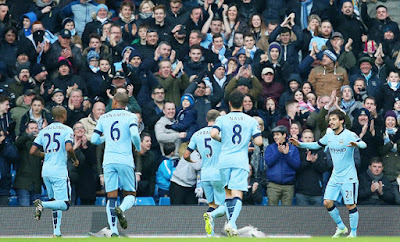 Reacting to Mourinho's "fake" comment, Pellegrini said the margin of victory was "the minimum we deserved", but he shied away from the suggestion that City had made a statement at this early stage. "We are not sending a message to anyone," he said. Victory was not secure until a header from Vincent Kompany and a rasping drive from Fernandinho in the last 11 minutes swelled City's lead, but the foundations had been laid by Aguero, who looks back to his devilish best after taking time off following the Copa America. "I think Sergio Aguero is in the best moment of his career," said Pellegrini, whose side top the table on goal difference from Leicester City and Manchester United. "He is a very important player for us. He showed that also last year. He was the top scorer. I believe this season he can be even better."